We can’t sit back while others engage in hard and soft power strategies to win influence, not if Australia is to positively shape the Indo-Pacific. That is one of the key messages of last week’s foreign policy white paper. Instead, we’ll need to innovate and cooperate with others to give us the greatest range of policy options to advance our interests. The recent quadrilateral meeting of senior officials from Australia, the US, India and Japan earlier this month is one example. Another example occurred last week in New Delhi. I sat down with representatives from Australia, India and Indonesia for the third meeting of the Track 1.5 trilateral dialogue on the Indian Ocean (TDIO) hosted by the Indian Council of World Affairs. And today, Indonesia will host the first dialogue between officials of the three countries. 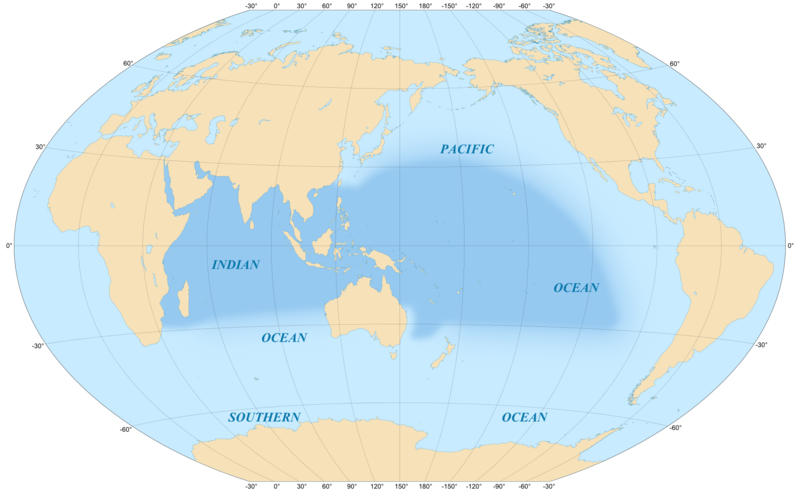 The impetus for the TDIO originally came not just from shared geography, but from a desire to invigorate the Indian Ocean Rim Association (IORA). Australia, India and Indonesia are key IORA members. For a six-year period, the three states set the IORA agenda. In November 2011, India assumed the chair; then, after a two-year term, it made way for Australia. Indonesia took over in 2015. (South Africa is the current chair and the UAE is the vice-chair.) The six-year stewardship of the grouping by the three countries produced significant institutional and program advances for IORA. 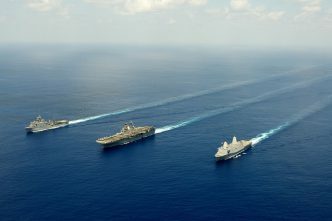 But Canberra, New Delhi and Jakarta now recognise that as neighbouring democracies in the eastern Indian Ocean, they have opportunities for additional trilateral cooperation in areas such as disaster relief, maritime security risks, marine science, sea lane security, and illegal people trafficking. At the TDIO, I was asked to speak on fisheries cooperation in the Indian Ocean. I had several key messages. The three TDIO states can contribute to better fisheries management by working with Indian Ocean bodies to help build capacity, skills and governance. Indian Ocean fisheries management is diverse in its scope. But compared to the Pacific, the Indian Ocean is the wild west. We should prioritise areas related to monitoring, control and surveillance. I argued that a key issue here is the management of the neritic tuna and tuna-like species that are of central importance to the coastal states, but not to the distant-water fishing states. 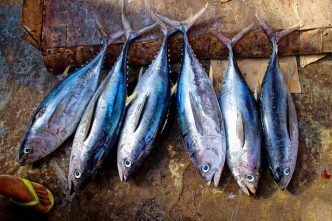 These smaller tuna species are very important for both Indonesia and India, as well as states like Malaysia and Bangladesh. They occur across the Indian Ocean rim, making them a perfect focus for the three countries to promote as an IORA initiative. 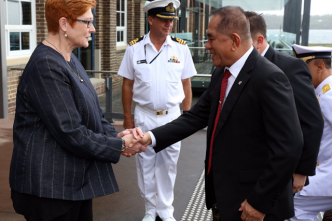 I noted that Indonesia and Australia have a common concern over shared stocks in the Arafura and Timor seas and in Indonesian traditional fisheries in Australian waters in the Timor Sea. I pointed out that our fisheries researchers have a long history of close cooperation on southern bluefin tuna and, more recently, on tropical tuna in both the Indian and Pacific oceans. But with India we’ve yet to really engage on broader fisheries issues. To date, India’s greatest interest in Australia seems to be gaining access to its markets, fishing waters or products. But India is keen to develop the sophistication of its fisheries market access and associated management capability. I suggested that Australia would be keen to work collaboratively with India on areas of mutual fisheries interest, such as the use of modern genetics to trace fisheries products, which would assist stock management and help combat illegal, unreported and unregulated (IUU) fishing. I was keen to promote ideas on how the three countries could cooperate to combat IUU fishing. For example, we should be encouraging flag state vessels to use vessel monitoring systems and promote greater monitoring of transshipment at sea. We could consider encouraging Pacific fisheries observers to undertake observer operations on a fee-for-service basis in the region. Currently, there’s very weak observer coverage in the Indian Ocean. We could promote the e-monitoring of vessels with camera footage. Seventy-five Australian fishing boats use this technology and they’re finding that log book reporting is improving. And we should, as occurs in the Pacific, be promoting a high seas boarding and inspection regime in the Indian Ocean. I noted three positive steps in tackling IUU fishing in the region. First, in March Indonesia opened the International FishFORCE Academy to train enforcement officers and promote interagency cooperation. Second, Mauritius recently announced that it will assess all the fishing vessels operating in the waters of the Indian Ocean Commission states to study their identity, history, ownership and activities, with a view to preventing, deterring and eliminating IUU fishing. Port Louis is one of the major ports for the tuna fleet operating in the Indian Ocean. Third, in the western Indian Ocean, eight countries recently launched a program to examine the legality of their licensed industrial fishing vessels. This will cover around 500 fishing vessels. I stressed that all three countries should promote a follow-the-money approach to identify and sanction beneficiaries, ensuring that they enjoy no benefits from their illegal activities. Our three countries should be encouraging Indian Ocean states to fully adhere to the FAO Port State Measures Agreement, RFMO rules and regulations, the UN Convention on Transnational Organised Crime and its protocols, and the UN Convention on the Law of the Sea and relevant ILO conventions. We should promote the idea of creating a blacklist of vessels in the Indian Ocean, as they have in the central and western Pacific. My overall message at the TDIO: our three countries can work together to bolster fisheries governance in the Indian Ocean region. The meeting underlined that an Australia–India–Indonesia trilateral could be a powerful force for change in the eastern Indian Ocean. To take just one more (non-fisheries) example, the Indian navy now has at least one ship permanently stationed at the western approaches to the Strait of Malacca. 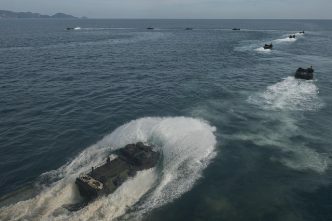 They often take the opportunity to work with the Indonesian navy in the area. As demonstrated by the recent large RAN Indo-Pacific deployment to the region, there’s a real opportunity for Australia to join in here. Anthony Bergin is a senior analyst at ASPI and senior research fellow at the ANU’s National Security College. Image courtesy of Eric Gaba viaWikimedia Commons.